April is the cruellest month, I wrote in these columns last Friday. Not only usually because *aluth avurudda* is a time when the unkindest cuts (power outages, price hikes, pointless protests, pretty little progress in poverty reduction) affect the general populace the most. But because in some quarters it sometimes has the propensity of “mixing / memory with desire, stirring / dull roots with spring rain”. That, in the midst of his death, we are in a half-life of our own is no more poignantly remembered than on his birthday/birth anniversary (5 April). That, in the midst of our living deaths, then (remember that awful regime? ), destiny struck on the very day (8 January) that his assassin’s cruel bows laid full low our harmless albatross – five years earlier (2009) – still rouses revolutionary passion among true republicans. That, election result and the reversal of arrogant despotism’s fortunes, as well as the undoing of a rule by fiat by arrant anti-democratic forces, could have been – and still can be – a cause for celebration for upholders of the law’s just causes and civil liberties such as freedom of speech. If only the powers that be could see that over and above Growth, Development, Progress, and all the other tough-minded criteria that can be measured, the true worth of a government and the society it represents is to be found in promises kept on a word given. If so, then they – a coalition with potential for national transformation like no other in our history – would be fit for posterity’s forgiving pages. If not, and if they won’t / don’t / can’t make good on promises made, in good time, then the tender-hearted books of life will record no more gracious a verdict than for any other administration culpable of succumbing to realpolitik. It would be politics as usual (at best) or cynically exploiting a demographic to secure their own ends (at worst). In the long run, we – and he, like us – may be all dead... But in the unforgiving now (and in poll times: the soon coming hereafter) someone will remember. Of course, all of this begs the question whether any such promise as has been interpreted by the average citizenry was ever made. Did the then aspiring government-to-be actually promise to bring Lasantha’s killers to justice? Or did another government waiting in the wings make generally attractive noises and placatory gestures like any other government to win people’s hearts – and votes? Time will tell. Because that’s all we have – and they have – to go on: time. We: those yearning for a case closed and assassins disclosed in this singular, symbolic case... They, those who promised that the death of an editor who stood as a singular symbol of assorted freedoms (never mind his own feet of clay or personal ambitions) would be sorted – Even as they hem and haw and hedge their bets... Especially as they field candidates for cabinet and marshal resources to militate in favour of future election victories. Let those who have ears hear, those who have eyes see! I expect that critics of critically engaged journalism and supporters or friends of the incumbent administration will be equally annoyed at or upset with me and my ilk (there are a few sterling others who won’t / don’t / can’t pass up each and every opportunity to plead our case). They will argue against or say things to us, like this... Why harp on minor matters when there are more major issues facing government today (balance of payments deficits, IMF strictures, nascent security threats)? Do let bygones be bygones (“don’t trouble trouble”)! Could it be that you have an ax to grind on behalf of the previous regime?! But here we stand. We can do no less if government will do no more. Under the bludgeoning of fate, infamous accusations, the fury of state mandarins – and in the face of the futility of the investigations being passed like a ruggerite’s odd-shaped ball from CID to TID to who knows what next (the FCID, maybe) – our heads are bloodied but unbowed. To cynical governmental campaigners or politically-seasoned citizenry, the idea of one man’s death being of such great import to anyone might seem to be suggesting Good Governance descend from the sublime to the ridiculous. It is an iota in a sea of jots and tittles, true... But it is an issue on which government’s true intentions, its great reputation for governance, and their real nature that no one knows or suspects, rests – And will hinge in future when the greater scorekeepers than UN peacekeepers (I mean voters and media agitators) come to write against government’s name... So do cease and desist from asking us to shut up, do. One is properly and painfully aware that not every other person will see the tragi-comedy of it, which is obvious to us as evident to all and sundry. For each idealist who perhaps unreasonably expects justice in our lifetime, there is a pragmatist who pooh-poohs the pleas of the families of the dead and the lost... For every relationship-oriented republican who wants to know where the bodies are (metaphorically speaking) and who the killers are, there is a results-driven pseudo-democrat who will encourage the dead to bury their own dead (maybe even literally) and bury the files. But if we are ever to emerge from the Dark Ages of Sri Lanka into the light and shade of our full potential, it is important for dreamers to remain sentimentally attached to the notions evoked in our collective conscience (the truth must out) and emotions aroused in our national consciousness (freedom and fairness for all) by a movement to usurp tyranny that dared to call itself a revolution. And if the people – at least that minority demographic who read this rag, and likeminded others – are willing, we are able to showcase some optional alternatives or possibilities. 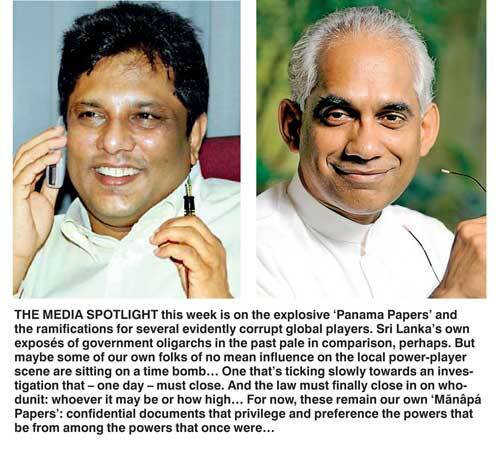 Eran Wickramaratne – a friend of Lasantha’s latter-day avatar and a champion of the free media – has our attention and our regard. Now he will earn all of our respect – to say nothing of the undying gratitude of the families of the murdered (be they an editor, a ruggerite, the nameless faceless hundreds if not thousands) – if he and his government will continue to champion with equal if not greater vigour the causes of justice with equality for all before the law which they once championed. In the end, we all fall – or stand – before some tribunal: voters, other interlocutors, donors, detractors, supporters. But there is one judgment seat before which nothing but the most brutally seared conscience can stand: A jury of one’s complicit peers. Shall we hold our breath hoping that there is no honour among thieves for truth to out?